Dr. Vimee Bindra is a renowned Gynecologist and Obstetrician in Hyderabad and is a Consultant in Apollo Group of Hospitals, Hyderabad. Dr. Bindra is also a prolific writer and has authored two well known medical books. She has a keen interest in Laparoscopic Gynecology and has Advanced training in Advanced Hysteroscopy and Lalaproscopy from Clermont Ferrand (FRANCE) under Dr. Revaz Botchorishvili and Gerard Mage and has done her Fellowship in Gynecology. Endoscopy under Dr. Rakesh Sinha, pioneer in Gynaec. Laparoscopic Surgery at Bombay Endoscopy Academy and Centre for Minimally Invasive Surgery (BEAMS), Mumbai. She completed her Masters in Hospital administration from ICFAI Has won several awards and medals for different academic contributions. She has training in ultrasonography and Colposcopy. Experience of training / assisting students to learn by using interactive discussion and hands-on approaches & to attain proficiency in subjects. Author of paper titled, “Laparoscopic management of 53 cases of dermoid cysts using Endo-bag” at BOGSCON February 2011 Co-Author of the paper titled, “Laparoscopic Myomectomy: Suturing the Myoma bed” presented at IAGE 2009 Co-author of the paper titled, “Pattern of prescribing drugs Among Antenatal Mothers” presented at AICOG 2007. Co-author of the paper titled, “ A Randomized Comparison of two different Antibiotic Regimens for Prophylaxis at Cesarean Section” presented at 9th Tapasi Nag Memorial Short Paper Presntation, 2007 Co-author of the paper titled, “” presented at the BOGSCON 32nmemnd annual Conference 2006 Extensive and quality experience in Laparoscopic and Hysteroscopic Surgeries, infertility enhancing surgeries, pelvic cosmetic and reconstructive surgeries and treatment of PCOS. She specializes in doing doing Laparoscopic Hysterectomies of big uterus without leaving a big scar on abdomen. LARGEST UTERUS REMOVED LAPAROSCOPICALLY BY HER WEIGHES 2200gm Gourishankar Kamilya, Arup Kumar Majhi, Joydev Mukherji, Subir Kumar Bhattacharya, Subrata lal Seal, Vimee Bindra. Reasons for pregnancy Termination- Lack of Knowledge, Negligence or Failure of Contraception. Indian Journal of Perinatology. 2006 May; Vol 18 No1. Author of a book titled “Obstetrics and Gynaecology for Post Graduate Medical Entrance Examination” published by Aditya Medical Publisher. Multiple and Bilateral Dermoids: A Case Report Rakesh Sinha, Satinder Sethi, Chaitali Mahajan, Vimee Bindra Journal of Minimally Invasive Gynaecology. 2010 Mar; Volume 17, Issue 2, pages 235-238 Author of a book titled “PRACTICAL MANUAL OF OBSTETRICS AND GYNAECOLOGY FOR ESIDENTS AND FELLOWS” by JAYPEE BROTHERS. Apollo Cradle is highly recommended birthing place. I had a very joyful journey at Apollo Cradle during my stay. All the staff were very friendly. One the day I admitted there I was surprised to see the ambience; it was too welcoming. Special thanks to Dr. Vimee Bindra for offering best care. Mrs.Debashri – Jubilee Hills, Hyderabad. I would like to thank Apollo Cradle for giving me this memorable birth delivery experience. I was under the care of Dr Vimee Bindra. She is simply awesome and one of the best. She made my time in the hospital memorable and a big thank you to her. The nurses were also amazing, and the front office team was efficient. The single deluxe room was comfortable and clean. Thank you for being a big part. Mrs.Asra – Jubilee Hills, Hyderabad. Mrs. Aisha Ahmed – Jubilee Hills, Hyderabad. I had the best experience with Apollo Cradle. When you arrive at the hospital, the hospital staff do a quick check in and explain the process nicely. The discharge procedure was also done professionally. My doctor, Vimee Bindra was amazing and made sure my delivery was smooth. Mrs.Lousia Jacob – Jubilee Hills, Hyderabad. Apollo Cradle is such a wonderful hospital. I got admitted here for my delivery under the care of Dr Vimee Bindra. She is a fantastic doctor and both, me and my husband are really thankful to her. I liked her calm, open-minded and confident style. The deluxe single room is spacious and comes with a television. Unlike other hospitals, you will look forward to your hospital meals in Apollo. All the staff members are also remarkable. I chose Apollo Cradle in Kothaguda for my delivery and I found a great gynae in Dr Vimee Bindra. She took great care of me and was always ready to help. She cleared all my queries patiently and cleared all my doubts. The hospital staff is knowledgeable and the admission/discharge procedures are done swiftly, without wasting time. I had opted for a deluxe single room, which was good. I had my delivery done in Apollo Cradle under Dr Vimee Bindra. My stay here at Apollo was comfortable and I faced no troubles during the stay. The staff ensured our comfort and catered to all our needs time to time. The nurses are very responsive and addressed all our concerns. The doctor explained everything very clearly and was very helpful. I’d surely recommend it to my family and friends. My experience at Apollo Cradle, Jubilee Hills was excellent. Dr Vimee Bindra is very knowledgeable, skilled and treats you with politeness. The nurses are very responsive and soft-spoken. All your needs are taken care of, the meals are provided on time and a clean environment is ensured. My stay here was very comfortable. I would surely recommend Apollo to others. We chose Apollo Cradle, Jubilee Hill for my delivery and I surely had the best experience at Apollo. Here, I was attended by Dr Vimmi Bindra, who is a kind and skilled doctor. The staff, including the doctor, nurses, housekeeping, all made me feel at ease during the course of my stay. The meals were given on time and were of good quality. I’d recommend it in the future! I came to Apollo Cradle, Kondapur for my delivery under the care of Dr Vimee Bindra and I am highly satisfied with the treatment I received here. From the admission to discharge, we did not face any troubles. The complete experience was very smooth and homelike. The doctors are skilled. The nurses and housekeeping staff attend to your needs and are well-behaved. I would certainly recommend it to my family and friends. 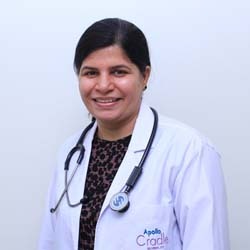 I came to Apollo Cradle for my delivery under the care of Dr Vimee Bindra, who performed her job skillfully and made sure I experienced no inconvenience. We opted for the luxurious suite, which was well-equipped and everything was in good working condition. The washrooms were clean. The staff here is very responsive and caring. The meals served were satisfactory. I would surely recommend it to my friends and family. I chose Apollo Cradle, Jubilee Hill for my delivery and had a great experience here. I was taken aback by the hospitality at Apollo. The staff is hospitable, caring and empathetic. They cater to all your needs and ensure your complete comfort. The food is provided on time and is of fine quality. Dr Vimee Bindra addressed all our issues and queries with efficiency. Apollo Cradle provides exceptionally good service. The doctors, nurses and housekeeping staff were very supportive, and kind. Thanks to the entire staff at the hospital for being so supportive. Thank you to Dr. Vimee Bindra and all nurses because they are really efficient in everything they do. I am happy because I did a C – Section in this hospital, with experienced staff caring for me. I wish success to everyone here. With Cradle, Apollo has proven its brand reputation whether it comes to services, doctors, nurses, or house keeping. Excellent! Everyone made us feel at home. I am really happy to deliver my baby in Cradle. I will refer this hospital to my friends as well.